No analysis data available for this batch... it is on the way! Wonderful for muscular aches and pains. Extremely grounding. Black Spruce Essential Oil has an immediate grounding effect. It is great for centering, calming and focusing. If one can picture the full, majestic Black Spruce tree, a sense of rootedness and expansiveness occurs. Once feeling grounded, we can feel more connected to our breath, opening and expanding on many levels. 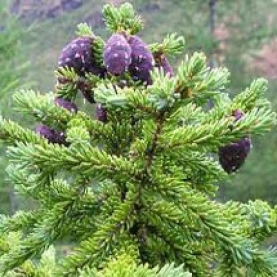 Black Spruce Essential Oil is distilled from the needles of the tree, which provide respiration for the whole tree. No wonder Black Spruce essential oil allows us to feel more connected…to the earth and to the breath. This essential oil is wonderful when working with the root (1st chakra) and heart (4th chakra). It assists us in working with our shadow side thus allowing a higher vibration to occur. Black Spruce Essential Oil allows us to recall memories. The oil has a way of connecting us not just to the earth and breath, but to ourselves as well, reminding us of memories from days gone by. We have found that when we are connected deeply to the earth that we can then open up to our higher selves. When we can feel more comfortable and grounded in our physical bodies, all things are possible! Black Spruce Essential Oil has always been one of the essential oils that we reach for time and again especially when dealing with any muscular issues. It has a way of penetrating deeply, yet gently, thus allowing the muscles to relax and be soothed. Black Spruce Essential Oil is rich in monoterpenes that give this oil its anti-inflammatory and analgesic, mucolytic & respiratory therapeutic effects. Black Spruce Essential Oil is antiseptic and expectorant and therefore is ideally used for many respiratory issues. It is an ideal remedy for many lung ailments such as asthma and bronchitis especially when used in an inhalation blend. It can be used in diffusers, since it is known as an airborne deodorizer and decongestant. It can also be used in salves or creams for the same respiratory benefits. According to Dr Kurt Schnabelt, Black Spruce is also known to strengthen and support the adrenal glands during times of stress and fatigue. This supports the fact that Black Spruce is not only calming and sedating, but uplifting as well. Picea mariana is a slow growing, small, upright evergreen coniferous tree averaging between 15-50ft tall. It often has a characteristic cluster of branches at the top forming a club or crow's nest. Black Spruce is the provincial tree of New Foundland and labrador. The Black Spruce tree grows along side other trees such as White Spruce, Red Spruce, as well as Larch (aka Tamarack). The forests in which they grow harbor safety of much wildlife such as deer, moose and elk. This symbiotic relationship adds much to its energetic properties. Black Spruce is a great essential oil to promote a sense of centering, calm, focus. Black Spruce instills a sense of rootedness. Once feeling grounded, we can feel more connected to our breath, opening and expanding on many levels. Black Spruce Essential Oil has a significant percentage of camphene. This monoterpene is known specifically to be a powerful mucolytic so it is quite beneficial for respiratory issues such as bronchitis, asthma and coughs. Camphene is also a powerful antioxidant that also adds to its therapeutic benefits when dealing with any respiratory issues. The a-pinene and bornyl acetate chemical components give Black Spruce essential oils anti-inflammatory and analgesic properties, as well as the energetic & emotional support for calming & sedating - therefore it is a great addition to pain blends. Kurt Schnaubelt writes about using 5% Black Spruce essential oil in a blend to help with adrenal fatigue. Add essential oils to 2 oz unscented lotion or carrier oil such as Jojoba. This is a wonderful blend to relieve pain and inflammation in muscles and joints. No known specific safety concerns associated with Black Spruce Essential Oil. If oxidized, it may cause skin irriation and sensitization. Damon K., Damon P. Aromatherapy Scent and Psyche. Rochester, VT: Healing Arts Press; 1995.